Brand new 2019 uncirculated silver British Britannia Monster box. Each box contains 500 coins, stored in 25 tubes of 20 coins each. 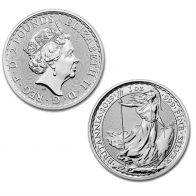 The packaging is provided directly from the Royal Mint in the United Kingdom. 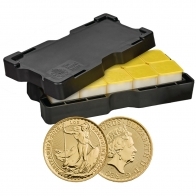 The British Britannia coin series is one of the most popular issued by the Royal Mint, and is available in gold and in silver. The silver Britannia features an image of Lady Britannia, walking with a trident in one hand and a shield in the other. 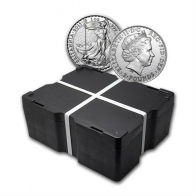 Silver Britannia monster boxes are available for silver investors looking to buy silver in larger quantities. 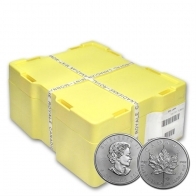 SwissBullion.ch sell the silver Britannia monster box for VAT-free Swiss storage or delivery.